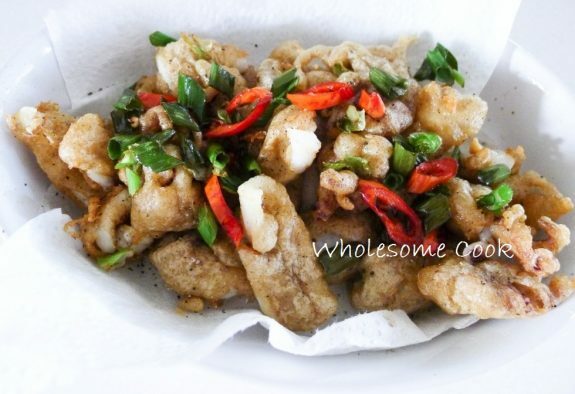 Crispy Salt and Pepper Squid has become one of the staples of modern Australian cuisine, but it’s easy to make at home. So how did I come across this recipe? Trial and error. Lots of trial and plenty or error… I’ve tried too many variations to recall them all, BUT at least now I can share one recipe that’s an instant success. The squid hidden inside the spicy crunchy coating is soft and so morish. And it’s all very simple to make at home. 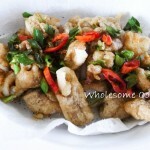 This Salt and Pepper Squid recipe is easy to make at home and tastes exactly like the squid bought at cafes. For a more spicy flavour, add extra pepper. Rinse squid tubes under cold running water and dry off thoroughly with paper towels. Cut squid into bite-sized pieces and score the "fleshy" side on the diagonal to form a diamond pattern. Mix flours, pepper and salt in a bowl and add squid. Toss to coat well. Heat oil in a saucepan until very hot - test the temperature by dropping in a small bread crust, if it sizzles and bread turns golden brown within 10 seconds, the oil is ready. Using tongs, drop in small batches of about 5 pieces into the oil and cook until the crust turns golden. Remove with a slotted spoon and drain on absorbent paper towel. Repeat with the rest. Fry up diced shallots and chilli to garnish. Serve immediately, or reheat in a very hot oven or under the grill. Tasted salt and pepper squid for the first time at a restaurant in Noosa. It was so delicious, glad to get the recipe. We don’t seem to have it here in Cape Town. The best salt and pepper squid I have had by far was from a little cafe style restaurant alongside the Goolwa Bridge in South Australia. The batter was ‘barely there’ but the flavor and presentation were 10/10. Just how they got such a thin batter I do not know. And they served the whole squid – cut into rings but not totally severed, so it came out as one piece. Beautiful….